This article is intended to guide how to setup DUO MFA in Parallels RAS. You can also refer to a this video guide at Parallels Youtube Channel. 1. Download DUO Proxy Authenticator. Use the default installation instructions and you will notice that DUO service is not running in services.msc. This is expected, because authproxy.conf has to be configured for your environment. Please refer to Authentication Proxy guide for additional information. security_group_dn - To further restrict access, specify the LDAP distinguished name (DN) of a security group that contains the users who should be able to log in. Others users will not pass primary authentication. 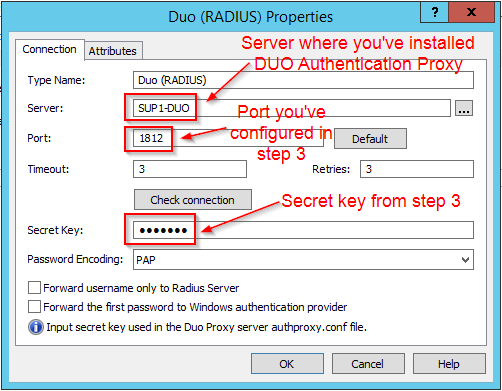 [duo_only_client] - to use Authentication Proxy for secondary authentication. This section has no additional properties to configure. 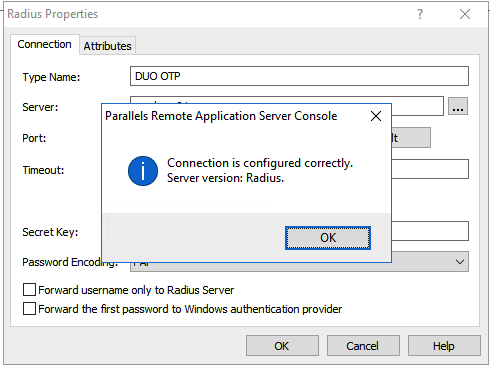 [radius_server_duo_only] - to use a RADIUS integration which does not handle primary authentication credentials. The user's passcode or factor choice, encrypted using the PAP mechanism, is submitted for the RADIUS password. radius_ip_1 - IP address of your RAS Publishing Agent. 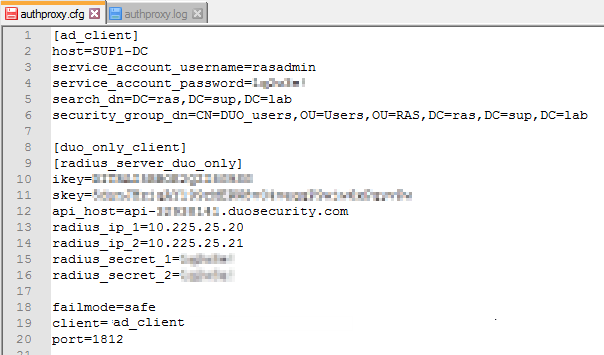 failmode - Either "safe" or "secure", defines the behavior of the system when Duo's service cannot be contacted. When set to "safe", authentication attempts will be permitted if primary authentication succeeds. When set to "secure", all users' authentication attempts will be rejected. client - The mechanism that the Authentication Proxy should use to perform primary authentication. This should correspond with a "client" section elsewhere in the config file. Set "ad_client" to use Active Directory for primary authentication. Make sure you have an [ad_client] section configured. port - Port on which to listen for incoming RADIUS Access Requests. By default, the proxy will listen on port 1812. 8. Click Apply and the next time users logon they will have 2-factor-authentication enabled.